The Under 14's are currently top of the A Division and played Seymour Villa in a very entertaining game that ended 0‐0 after extra time, Waterloo were narrowly beaten 5:4 in a tense penalty shoot-out! 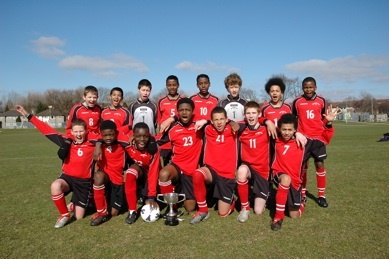 The Under 15’s displayed a fantastic performance beating last season's London FA Cup Champions, Wandle Wanderers 4‐2, which has earned Waterloo a place in the League Cup Final. in the London FA County Cup Final. 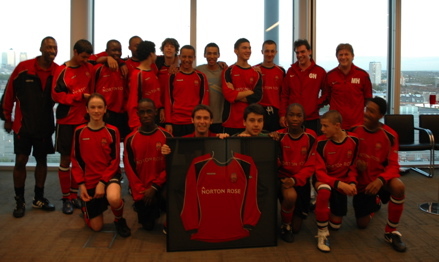 On 14th September 2011, Norton Rose invited Waterloo FC to take part in a 5-a-side match with the company's Football Team, followed by a Reception with food and refreshments at their offices in Tower Bridge. All the young people really enjoyed the event and expressed that they appreciated the new experience and all that Norton Rose have done for the Club. The Team presented Norton Rose with a framed Waterloo shirt, to thank them for all their support. Gabrielle Archer and Rehana Reid from the Capital Community Foundation also attended and Waterloo FC is extremely grateful for all their support over many years. Former Waterloo player Aziz Deen-Conteh, represented his country in the England U19 side, as they got their international campaign underway with a well-earned 0-0 draw against Holland on 1st Sep 2011. Members of Waterloo FC travelled to the Netherlands, to support the young lions, who delivered a very good performance. Aziz has also been selected for the U19's squad in the upcoming France v England game on 5th Oct. Fantastic Celebrations took place in July 2011, attended by young people, parents and supporters to acknowledge the achievements of all the young people in the Club. Players from the U13 and U14's were presented with Tandridge League winners medals and also trophies from Waterloo FC in recognition of all their effort and commitment in the 2010-11 season. Volunteers received awards from the Club in acknowledgment of their vital support to all Club activities. The Club has met with Ashley Muldoon MD, Matthew Hewitt, Project Director [Strata SE1] and Anne Corr, Brand & Marketing Manager of Brookfield over the last 9 months. The company is highly supportive of our work and have agreed to build a new study support centre/clubhouse at the Lillian Baylis Community Hub. 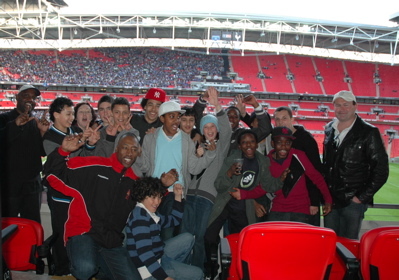 On 11th April 2010, Brookfields invited 20 young people from the Club to watch the FA Cup Semi-final at Wembley Stadium in the Brookfield corporate box. Waterloo FC is extremely grateful for this fantastic opportunity, many thanks to Brookfield for making this such an amazing experience for our young people, who all thoroughly enjoyed the day. "Watching the FA cup semi-final at Wembley was one of the best days of my life. t's one thing to watch a football match but to watch it the way we did was incredible. Many thanks to Mandy Ayres and the NIKE team, who sponsored the fantastic 4th Generation turf pitch at the Lillian Baylis Community Hub. The pitch is a FIFA 2* certified long piled synthetic turf which does not require infill to give the surface its performance. This facility has allowed Waterloo FC to run it's academy coaching sessions, three times a week over the last year. 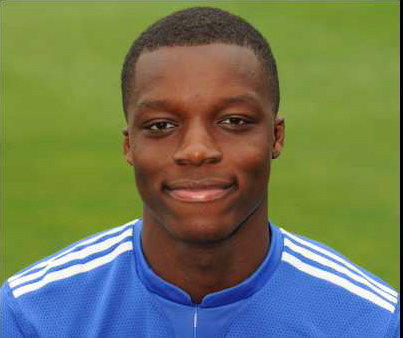 Congratulations to former Waterloo youth player Aziz Deen Conteh, who came into the Club aged 10 and who signed a two year professional contract with Chelsea FC. He left Waterloo and progressed to Chelsea Academy as a 14-year-old, since then he has played for England U16's in the Sky Victory Shield in 2009, the FA Youth Cup Final - Chelsea v Aston Villa FC, voted Players Player of the Year 2010 and has now been promoted to the Chelsea Reserves and England U19's squads, which is an amazing achievement. Aziz grew up in the Elephant and Castle area and first attended our summer estate based project, in which his potential shone through and was supported by Waterloo FC's funded programmes for 4 years. Aziz's former coach and manager, Arnie Reynolds said "We are all so proud of Aziz who is an amazing young man who shows what can be achieved through hard work, dedication, support and a strong mental strength". Travis Gregory [Chelsea FC] . The evening included achievement awards to 150 young people and 30 received Sports Leaders Awards which they completed during the summer. Volunteers were recognised for their hard work and commitment to the Club.